The ASUS P8Z77 WS brings Intel Z77 Express Chipset and next generation processor technologies to a package custom-designed for small businesses and professionals. Gen3 four-Way CrossFireX graphics power works up to 50% faster than the previous, while dual Intel LAN ports leads to a 71% lower CPU utilization, increasing throughput to achieve outstanding performance as well as better support for diverse operating systems. And with the newly designed Virtual Vsync, users can enjoy a smoother gaming experience by eliminating tearing artifacts. ASUS also provides several exclusive features that augment computing experiences, including Fan Xpert 2 detailed fan management and Network iControl bandwidth allocation and prioritization. The P8Z77 WS supports Gen3 Four-Way GeForce SLI, and offers a 50% increase in overall graphics processing power when compared with PCI Express 2.0-outfitted workstation motherboards running 4-Way CrossFireX. 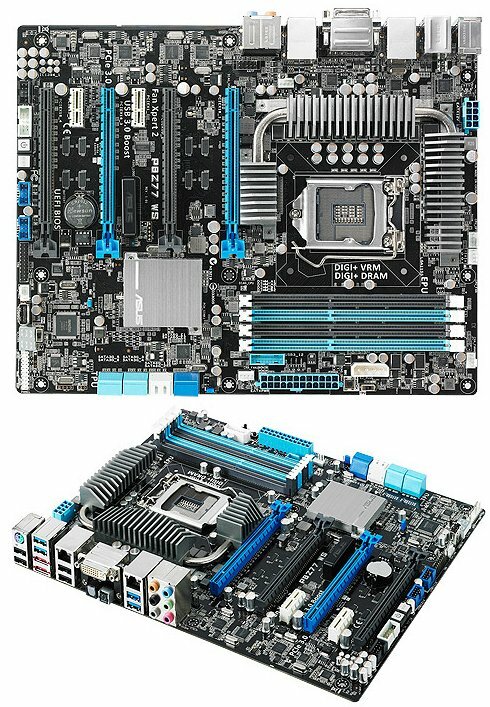 The motherboard has four PCI Express 3.0 x16 slots, which deliver up to twice the bandwidth of physically-identical PCI Express 2.0 slots, and thus allow for greater expandability towards professional applications or the most demanding gaming usage. ASUS markets the P8Z77 WS primarily to commercial and professional clients, including fields such as mechanical and architectural design, interior design, aeronautics, and high-end audiovisual production and editing. Hardware Intel Ethernet relieves much of the processing load placed on CPUs during online tasking, reducing processor utilization by as much as 71% on the P8Z77 WS compared to similar workstation offerings from other brands. In addition to improved efficiency and system response, benefits include a more stable and reliable connection with lowered latency and packet loss. With support for all major operating systems, the P8Z77 WS with its dual Intel Ethernet design enables twice the bandwidth of a motherboard equipped with just standard Gigabit Ethernet, increasing throughput for faster and more stable online performance. LucidLogix Virtu MVP can increase graphics output by as much as 60% beyond its original performance. With LucidLogix Virtu MVP onboard, the P8Z77 WS has a more generous graphics threshold to work with, allowing LucidLogix Virtual Sync technology to use the bigger overheard to clear up artifacts and screen tearing during gaming, HD video playback, and other applications. And with intelligent graphics chipset allocation, the P8Z77 WS boasts up to three times faster video conversion, combining LucidLogix Virtu MVP with Intel Quick Sync Video 2.0 technology without compromising the power of NVIDIA or AMD graphics cards. Like other ASUS 7 Series motherboards, the P8Z77 WS ships with Fan Xpert 2 technology, which automatically detects thermal properties inside the case to adjust CPU and chassis fan speeds. In addition to auto tuning, the Fan Xpert 2 interface arrives with very detailed settings that let users determine the performance of each fan individually as required. The end result is desktops and workstations that run significantly cooler and quieter thanks to smart fan supervision. Network iControl presents another ASUS exclusive debuting on 7 Series motherboards. An intuitive network bandwidth control center, the utility makes prioritizing applications and programs by network access and bandwidth possible with a single click. Multiple profiles may be created, for example gaming, file sharing, video streaming, and so on, assuring smoother connections that avoid slowdown even when additional data downloads or uploads in the background. Network iControl also features auto PPoE network detection and setup for faster installation, helping users get online quickly with greater convenience in a single step.